Soybean oil, water, sugar, sour pickle relish [cucumbers, vinegar, salt, water, calcium chloride, aluminum sulfate, turmeric (color)], tomato paste, distilled vinegar, salt, egg yolk, potassium chloride, propylene glycol alginate, spices (mustard flour), onion powder, phosphoric acid, xanthan gum, sorbic acid and calcium disodium edta (used to protect quality), natural flavors. The Hellmann's name is recognized throughout the world for unrivaled quality and flavor. 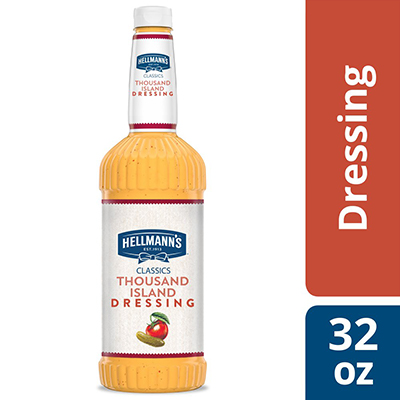 Hellmann's Classic Thousand Island Salad Dressing offers premium quality with shelf-stable convenience. This gluten-free salad dressing is also versatile, with alternative applications ranging from marinades and dips, to glazes and finishing sauces.